Today on OUPblog we’re celebrating the 90th birthday of Nelson Mandela. Elleke Boehmer, author of Nelson Mandela: A Very Short Introduction, is Professor of World Literature in English at the University of Oxford.. In the piece below Professor Boehmer recounts moments spent observing ‘on the ground’ the symbolic legacies of Mandela during a research trip to South Africa at the end of 2006 and in 2008 – legacies at once durable yet intangible. November 2006, the new Johannesburg. South Africa’s largest city is a capital of crime, as always, but it is also more exuberantly on the move than ever before. The security walls are higher than during the apartheid years but the inner-city malls are vibrant with cultural confidence, heightened today by the luminous purple of the blooming jacaranda trees. And Mandela, the name, the international image, forms an indelible part of this atmosphere, even now, years after he stood down as president. It’s not only because I’m sensitized by writing about Mandela that I’m picking up on the widely broadcast references. Madiba seems to be the universal emblem for all that is celebratory in this country still struggling to shake off its legacy of social and economic division. Much that is edgy, far-sighted, and integrative about these racing streets, like the new steel Mandela bridge sweeping from the university district into the inner-city, feels like a tribute to him. P.W. Botha died yesterday and the newspaper billboards wired up on lampposts in amongst the jacaranda flowers announce Mandela’s words of tribute to his old rival. In a leafy suburb my friend and I visit the Nelson Mandela Children’s Foundation, a fine house set in a manicured garden, which also houses the Oprah Winfrey Foundation: two transnational black icons nestled side-by-side. Downtown in Kort Street, a row of shops so short it does not appear on the city map, is Kapitan’s Indian restaurant, where Mandela once acquired his taste for prawn curry. Kapitan’s is the only venue from the cosmopolitan 1950s that has survived, though today it is closed, the shuttered shop-front unwelcoming. Come to think of it, though the marks of Mandela are pervasive they are at the same time strangely elusive. Like a presiding genie, Madiba feels to be all around, an eminence about to be perceived just round every corner, and yet he is nowhere to be pinpointed. What does Mandela mean to the city’s citizens today? We travel to the Constitutional Court, where Johannesburg’s infamous Fort prison once stood, through which Mandela and Gandhi passed. The ‘permanent’ installation showing Mandela’s cell, complete with prison blanket, has been temporarily shut down for refurbishment. Beyond a dismantled archive, will we be able to find the palpable presence of Nelson somewhere, under this perfect blue African sky? We drive to my friend’s favourite shop, in an upmarket shopping centre, which sells a variety of expensive retro-chic t-shirts bearing the image of Steve Biko and Drum magazine covers. However Mandela’s image, now too clichéed, too establishment, decorates no cap or t-shirt. Only outside on the pavement a street-trader sells clay fridge-magnets of Nelson in his trademark Madiba shirts, alongside other tourist trinkets. We continue on to the Nelson Mandela Square nestled within the even more upmarket conurbation of Sandton City. Here a bronze statue of a gormlessly smiling Madiba in jive-step, paid for by public subscription, towers over a series of smart restaurants catering for an upwardly mobile clientele. Among the shoppers strolling by, few other than the tourists bother to squint up at the strangely uninspiring figure blocked against the sun. The question arises, has Mandela the commercial trademark of the Rainbow Nation come to overshadow his other points of cultural reference in the showcase of the new South Africa—his significance as an HIV/AIDS champion, a unifying national myth? Is he now at once too popular and too predictable to be acknowledged as the cornerstone of the country’s self-perception, especially from the insecure perspective of the current ANC government? Forty-four years ago, when he was arrested on the main road from Durban to Johannesburg only miles from where my best friend once lived, he was as a man-on-the-run at once more distant and yet ubiquitous to his people than he is as one-time leader now. A mark of the many roles Mandela played in his life-time—from Creon in a production of Antigone to Black Pimpernel—is that he is cited as a logo and heroic image within so many areas of cultural reference in this country whose story of moral triumph he authored. Yet it is in the nature of a symbol to be partial, not to encapsulate the whole story—especially remembering that its actual referent is here in this city today, walking about perhaps in his Houghton garden. The new South Africa both equates to the Old Man’s creation and yet, populous twenty-first-century country that it is, multiply exceeds it. Sandile Dikeni reminds us: ‘My people are this many and more and their collective name is bigger than that of Nelson Mandela’. In Lewis Nkosi’s 2006 Bildungsroman Mandela’s Ego, the boy Dumisa grows up in Zululand with the sense of Mandela as his life-mentor—the invisible household-spirit shaping the different stages of his life. Most South Africans could be described in the same terms as Dumisa. Mandela is the myth that they have lived and in some cases died by. Once again, his legacy extends everywhere through their lives, like a quiet music, yet he is nowhere to be precisely located. Outside the Houses of Parliament in Cape Town where Mandela once presided, another street-trader has a stall under the historic oak trees. He is among tens of other street-traders here in the one-time Dutch East India Company gardens. A short way off, as the ironies of historical proximity have it, stands a statue of Cecil Rhodes pointing north into Africa, at the base of the statue, Behold Your Hinterland. The stall is more or less within the direct line of Rhodes’s imperial gesture. The other stalls here on the oak avenue sell the usual fare: painted clay elephants, tin-can insects. This is why the street-trader in question stands out. His wares compared to these others are unique. No, this isn’t batik, he explains, but cloth cured in varying densities of rooibos tea. The subject of these painted cloths, none affordable to locals, is African wildlife. The only human subject is Nelson Mandela, full-face, once again smiling, hopeful, staring out into South Africa along the sight-lines marked by Rhodes. The ironies of historical proximity. Mandela and Rhodes. Botha and Mandela. Mandela, one journalist observes, is the icon who outgrew his country. Much as did Rhodes one hundred years ago. Already the world’s politicians are lining up to pay tribute to Mandela on his 90th birthday. Yet I am told that he himself would prefer to spend the day in quiet, perhaps in his garden, which, even in prison, has been his preferred refuge in times of trouble across the great length of his life. June 2008, a jaded Johannesburg. Only two weeks ago South Africans desperate for jobs and opportunities launched xenophobic attacks on Zimbabweans and other African migrants. The Rainbow nation’s bright colours are faded almost to invisibility. I arrive in the city to discuss my book and everywhere two strong responses confront me. Yes, people say, Madiba is still our national success story. But, at the same time, we feel we are running out of hope, running out of myth, unless the great elderly man once again makes himself heard. Throughout I have been struck by the number of times people have asked whether I have met Mandela. Have I been touched by him, in the flesh? Across his career Mandela has persuaded people through the tangible force of his personality. But now, it is clear, his fellow South Africans are in need of his presence as never before. They want feel his guidance but they sense that he is withdrawing from them, not into myth, but into deep old age. They see that his message of hope for the future based in hospitality, in getting on together, has never been as pertinent as now, but they know, too, that his message requires his presence. South Africans today are as hungry as they ever were for the Mandela myth, yet the future will have to find innovative new ways of making that myth real in their lives. 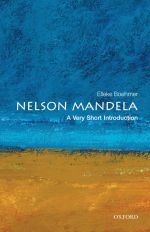 Elleke Boehmer’s Nelson Mandela: A Very Short Introduction publishes in the UK today. Her previous books for OUP include the anthology Empire Writing, and she edited Robert Baden-Powell’s Scouting for Boys. She also published her latest novel, Nile Baby, in June with Ayebia Clarke Publishing.